Uranium stocks have been quietly gaining in recent months, however, we expect materially more from the sector as it continues to rationalise in the medium-term. To put the current price of uranium into terms more familiar: we believe it is trading at the equivalent of oil at US$20 per barrel. Always attracted to non-consensus thinking and ideas, when the concept of investing in uranium was first brought to our attention, after considering some of the prejudice against it, we took note. In essence, the idea was simple: After the earthquake disaster in Fukushima (Japan, March 2011), demand for uranium fell away due to power stations coming offline as a result of the Tsunami. Demand was further impacted as Japan reassessed their safety standards and paused the construction of new reactors. Adding insult to injury, Japanese nuclear power stations were contractually bound to take delivery of uranium despite the closure of their sites. In an effort to minimise losses, that product was sold on the spot market. This fall in demand was not matched by production cuts, and so supply continued to remain strong. Simple economics dictates that this results in lower prices. Unlike many commodities which tend to have a price cap on the lower end based on the production cost of miners, the uranium industry is a little different. When a uranium company delivers its raw material to the processing plant, the material is run through the refiner for a predetermined amount of time, with the resultant high-grade uranium delivered back to the mining company. However, the process creates waste which if run through the refining plant again, will create additional sellable uranium, in this case, owned by the processing plant. As the cost of production for processing plants (from the waste material) is significantly lower than that of the miners, the price of uranium on the spot market had fallen materially below the cost of production for the miners. This unique circumstance saw some of the world’s largest and low-cost miners close operations, and saw the world’s largest producer of uranium (the nation of Kazakhstan) cut production in late 2017. At which point we became very interested. Though there is a stigma towards nuclear energy in Australia, the same cannot be said for many countries around the world. In fact, of the 31 countries around the world that make use of nuclear energy, one third of those countries generate more than 30% of their energy from nuclear power. 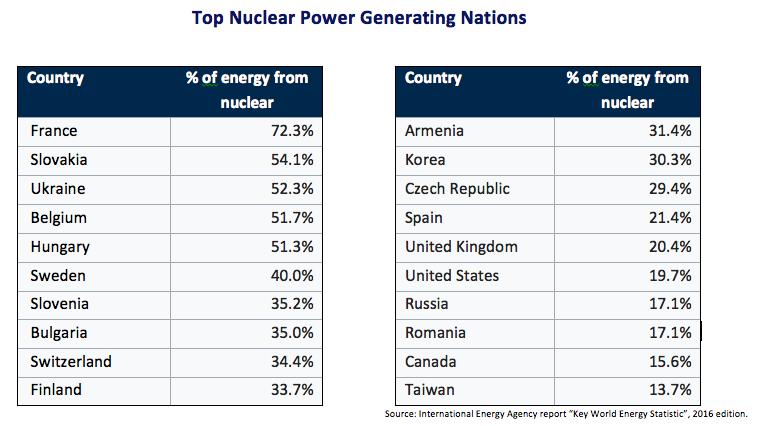 France leads the way with over 70% of their electricity coming from nuclear power stations, while the USA is the largest net producer of nuclear energy in the world, producing 20% of the country’s energy requirements. From a global perspective, more than 11% of the world’s energy is generated from nuclear power. Nuclear power is a clean source of energy and provides reliable baseload functionality, making it an ideal source of energy moving into the future. 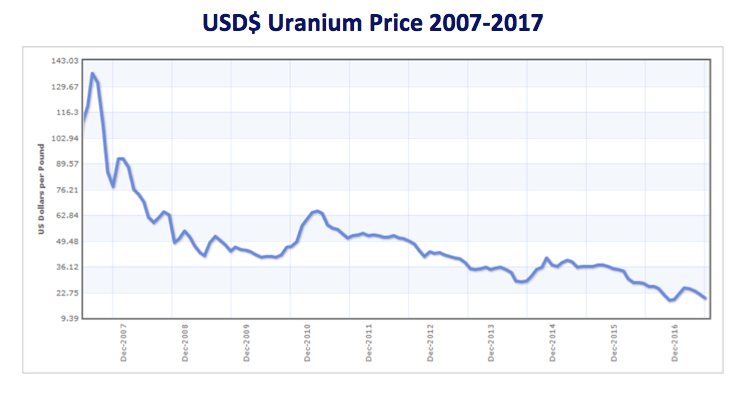 The price of uranium has been in decline since its recent peak of almost US$140 (in 2007). In recent months, the price of uranium has fallen as low as $20. In fact, since the disaster in Fukushima, prices are 70% lower. Cease selling product, and begin stockpiling. We’ve seen all three of the above levers pulled, and the response has been positive. In late 2017, Canadian producer Cameco shut down its biggest mine despite being among the worlds lowest cost producers. At the same time, Kazakhstan suggested it would reduce production by 10% before deciding to cut production by 20%. Additionally, Kazakhstan has put legislation in place which saw its uranium producers forced to sell their product on the spot market. The simple reason for the legislation was to reduce corruption and ensure that there was no market manipulation by the miners. However, the facts (lower prices, and no mechanism to withhold supply) as they currently stand call for change. Though the Kazakhstan government has been unwilling to amend the legislation, they have supported producers moves to set up uranium trading companies based out of Switzerland. In essence, the idea is that the miners would sell their product at the spot price to their partner company in Switzerland, who would then hold the stock or sell it to the wider market at higher prices. Though this is obviously not in the spirit of the legislation, the lawmakers in Kazakhstan have recognised that making this change is an important move to drive price stability in the market. In the most simple of terms, we recognise that the current spot price of $23.75 per pound is too far below the average cost of production of $60. Our takeaway is that either the cost of uranium increases to the point that producers are properly remunerated, or one in ten homes around the world forgo electricity for the foreseeable future. The former scenario seems more likely. ok, so apart from uranium futures, with whom do we invest? "Clean source of energy"? Nuclear has lower emissions than other fossil fuels at the point of power generation, but still requires extraction, refining and disposal. Agree, unless this is tradeable the article is only of interest. There is a Uranium ETF on the NYSE = URA and that looks like the best way to trade this. Maybe because people have learned that nuclear is overrated. What other uses are there of uranium besides weapons? Nuclear is dead. It's more expensive that renewables. Seems author is trying to offload some dud stocks. Agree, i took a holding in ERA @ 0.55 in Oct 17. @Hew Mills There are not a lot of ways to invest in the space. I'm not aware of many funds that have exposure to uranium at all. If you give me a call I'm happy to discuss how we built exposure in our Fund. Anyone observing the energy space would have recognised by now that nuclear power is too expensive relative to renewables and storage of any type and the gap is widening every day. So there will be very little growth in nucleaur power relative to renewable and storage going forward. Old plants will continue to close and fewer and fewer new plants will be built. Long term its a bleam outlook for the entire industry. @Richard Vivian, you make a fair point. The cost of building a nuclear power station is materially higher than an oil/gas/coal plant. The advantage that nuclear energy has over the long term is that its highly efficient, it has low cost inputs, and its carbon footprint is incomparably smaller than other traditional base load energy sources. I think a simple look at global users of nuclear power is the best measure of value: France generates over 70% of their energy from nuclear, and have done for more than 50 years. Their carbon footprint and electricity bills are among the lowest in the developed world. As battery technology improves we may be able to have a discussion about comparing renewable sources, but we are not there yet. Nor can we know what advances will be discovered to improve traditional energy in the future.